Ahhh, noodles. How we love thee. There’s no dish more comforting than a big, tasty bowl of slurplicious noodles. Whether they’re flat and wide or thin and spindly, we don’t discriminate. We want noodles and we want them now. Here’s where to find the best noodles in Auckland. Ask any noodle fanatic where to go and you will be sent straight to Eden Noodles Café. Their signature spicy dan dan noodles topped with crispy pork mince made waves around Auckland but the rest of their menu also deserves the same amount of recognition. Go for the dry Sichuan noodles in special sauce and opt for the chopped noodles. The cuts of noodles are thick, wide and chewy and they’re doused in a chilli oil sauce with pickled cabbage to add a good kick. While we’re at it, their spicy and sour dumplings are equally divine. 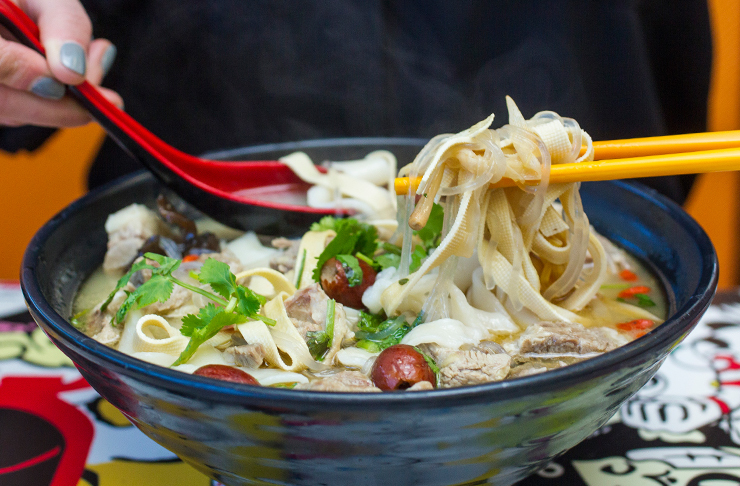 Auckland’s much-loved Shaolin Kung Fu Noodles dish up some of the best noodles in Auckland. The secret behind their deliciousness? Their noodles are made and pulled by hand. Pay them a visit and there’s a high chance you’ll get to witness the chefs (aka noodle masters) pulling, chopping and rolling the fresh noodles in expert style. Their fried Xinjing lamb noodles are our go-to, while spice lovers should opt to devour a bowl of their hot and spicy beef noodles. Xi’An Food Bar have slowly become an empire of noodles around Auckland with six branches open around town. When we say Xi’An, you say number 37 because this is everybody’s go-to order and Xi’An’s staple. The hand-pulled noodles are topped with tender pulled pork and homemade chilli sauce and each noodle is so long, it never seems to end. The cumin lamb burger is a must as well. For just $5 you get a flat pita bread stuffed with the juiciest chunks of spiced lamb and you won’t regret it. Near the end of Dominion Road is this hidden gem called Tang Du Style serving up Northern Chinese cuisine. Try something a little different with their cold clear noodles with hot peanut sauce. This sounds strange but trust us when we say that they are some of the chewiest most flavourful noodles in town with tender slices of pork placed on top. The hot peanut sauce is a complex flavour of chilli and deep nuttiness and is a one-of-a-kind dish that can only be found at Tang Du Style. Treat your taste buds to a flavoursome adventure at Saan. One of our favourite dishes here is their tiger prawn cutlets starring delightfully chewy, egg noodles. 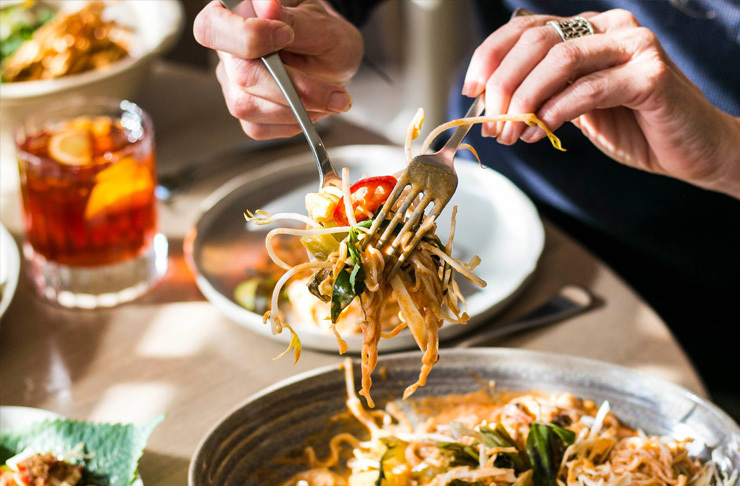 The noodles are perfectly complemented with marinated juicy prawns that have been cooked to perfection, bamboo shoots, bok choy and the all-important fresh Thai basil. Load your plate high and dig in. There are those days when one type of noodles just isn’t enough to satisfy the craving and that’s when you know to hit up Bunga Raya in New Lynn. This authentic Malaysian restaurant serves a special dish called Wan Dan Hor with added vermicelli and it’s filled with flavour and different textures. The soft and chewy rice noodles are drenched in an egg gravy but when you dig a bit deeper, you can find a hidden bed of deep fried crispy vermicelli noodles that add a whole lot of crunch to the dish. Look food truck Hapunan lurking around Auckland because they serve the best Filipino eats in town. The Beef Pares is their star dish. The sous vide beef just falls apart and melts in your mouth along with the chewy egg noodles that are marinated in a soy gravy sauce. The noodles are topped with fried garlic and you won’t be able to find these anywhere else. Don’t forget to get their Adobo Chicken as well, a bed of pandan rice with coconut chicken curry, you really can’t go wrong.